Little Office of the Blessed Virgin Mary: 28. JESUS LAID IN THE TOMB. 28. JESUS LAID IN THE TOMB. JESUS LAID IN THE TOMB. "O all ye that pass by the way, attend, and see if there be any sorrow like to My sorrow" —Lam. i. 12. Christ was put to death, indeed, in the flesh, but enlivened in the spirit. In which also coming He preached to those spirits that were in prison. The sun, having enlightened and warmed us throughout the day, disappears beneath the horizon, and we are left in darkness. It then sheds its life-giving rays on other regions, each in its turn, until dawn appears once more, and the sun returns to rejoice our eyes. 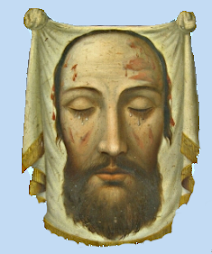 In the like manner, when the Divine Sun of Justice disappeared for a time beneath the horizon of Calvary, when the Body of the Holy One remained hanging on the altar on which it had been sacrificed for sinners, (Justus pro injustis.) His soul, living and glorious, descended with incomparable majesty into that region in which, from the beginning of the world, ; the just who had spent in holiness this mortal life of trial, were expecting their deliverance. "Whilst a double darkness covered the earth, the beautiful Easter day dawned in Limbus, hailed by the acclamations of all the saints of the old law. What joy is here ! On earth, few grateful souls were found to receive the good news but with what transports it is greeted here! How magnificent the alleluia with which that Easter hymn began! Of this we can form some notion, if we think of what -must have been the sufferings of those holy r souls who knew God, who loved Him alone, and who had been pining after Him, some of them for no less than four thousand years. Think of the patriarchs, Abraham, Isaac, and Jacob, greeting their Redeemer, who had sprang from their own race, and had been expected during so many centuries; Moses and the prophets rejoicing at the sight of Him whom they had announced, David recognizing his God in his son! What brightness and joy was there to be found in that mournful place, in which they had so long waited for the Deliverer, and suffered the privation of the sight of God, a bitter privation for holy souls, even with the hope of one day seeing Him. But, on earth all was darkness; the living Jesus was no longer there, and the risen Jesus had not yet come. The Body of the Victim still hung on the cross. Now, as it was the eve of the pasch, the pharisees came to find the governor. The letter of the law forbade them to leave so dreadful a sight before the eyes of the people, on the day consecrated to the Lord, and the scruples of the pharisees clung to the letter of the law, though they did not prevent them from crucifying the innocent. They therefore begged Pilate that the legs of the condemned might be broken, according to the custom, to complete their punishment, and that their bodies might be buried before the Sabbath Day. The weak governor sent soldiers who broke the legs of the thieves, but, coming to Jesus, and finding Him already dead, they did not break His legs. But one of them pierced His side with his spear, and immediately there came forth water and blood. Thus was accomplished in the true paschal Lamb, that command which God had formerly given for the typical lamb: "You shall not break a bone of him;" (Exodus, xii. 46. ) and that other word which He spoke by His prophet Zacharias: "They shall look on Him whom they pierced." (Zach. xii. 10.) These circumstances have been thus minutely detailed to us by the evangelist who was on the spot, a sorrowful spectator at the foot of his Master's Cross. By the side of John we see our holy Mother. These long hours found her standing, her eyes fixed on Jesus crucified. She was doubtless continuing the last prayer of her Son, and interceding with God for sinners, when that rough soldier, who had just pierced the Divine Body, found his salvation through the blood which sprung upon him, and immediately became . the disciple of the crucified, whose sentence He had come to complete. The rude Pagan was transformed into a faithful Christian, and he who caused to flow from the Heart of Jesus the last drops of blood shed for men, afterwards himself gave his blood for Him. He has his place among the glorious assembly of martyrs, and the Church honours him on the fifteenth of March, under the name of St. Longinus. Meanwhile, a just man of Arimathea, a member of the council of the Jews, but innocent of their crime, who in secret waited for the kingdom of God, went boldly to find Pilate, and asked of him the Body of Jesus. Pilate, surprised that He was so soon dead, sent for the centurion, and asked him if the Holy Victim had already given up the ghost. On his reply, he gave the Body to Joseph. Nicodemus, a timid disciple, who at the beginning of the public ministry of Jesus, had gone to seek Him at night, hiding his faith for fear of the Jews, came with Joseph to Mount Calvary, bringing perfumes. The Blood of their Saviour had already given them the courage to brave His murderers. They unfastened the Divine Body with reverence from the cross, and laid It in the arms of His holy Mother. Who can say what she then suffered; her Son, her God, lay dead in her arms. Doubtless the prophet had seen her thus contemplating the disfigured Body of Jesus, when he put in her mouth the words: "O, all ye that pass by the way attend, and see if there be any sorrow like to my sorrow!" (Lamentations, i. 12.) This sad picture, which so many holy souls have contemplated in their meditations, which so many artists of all ages have striven to reproduce, and to the grandeur and desolation of which no human understanding has ever succeeded in doing justice, will cause devout tears to be shed as long as there are devout hearts on the earth. Let us often contemplate it, and, with our Saviour, love the Mother who has suffered so much for us. Pools that they were, their guards became witnesses to see and tell of the wonders of the Lord. Here let us pause, at the moment when the shades of this second night are falling on the earth. In a few hours the dawn of the Easter morning will break; the bonds of the sepulchre will be broken, and the Conqueror of death will arise in splendour from the darkness beneath which He has hidden His glory. The just of the old law are singing in limbus the Alleluia of their deliverance; heaven opens to receive them, and in a short time both good and wicked on earth will acknowledge Jesus risen. From this darkness, which was so closely followed by the bright day of the Resurrection, let us learn to hope and to believe, when in an hour of deep grief we seem to have lost all. Let us then think of the soul of the Blessed Virgin Mary, when she had left the tomb of her Divine Son, and when, in the dwelling of her adopted son, she saw weeping around her the little flock whose Shepherd had been stricken. God had asked of her the sacrifice of her only begotten Son; she, like Abraham, had offered Him willingly, but her obedience had been proved even unto the end. She had drunk to the dregs the chalice of the sufferings of Jesus; was there ever sorrow like unto her sorrow? She had seen the Son of God die ; was there ever a trial of faith like unto this trial ? And yet Mary's Faith was as perfect as her obedience. She controls her boundless grief, she is the comfort of hearts less wounded than her own, and remembering the words of her Son, she hopes against all human hope. When our hearts fail us, when our dearest affections are laid in the tomb, let us not weep without hope. Let us think of Mary, firm in hope, even when her Son and her God was buried as though He were a mere son of Adam. A glorious resurrection and eternal happiness awaits every Christian soul after death, and it is not in vain that our Redeemer has destroyed its empire. 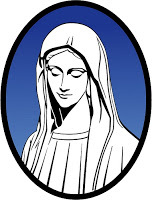 O Mary, whom our fathers have often called our Lady of hope, teach us to hope as thou hast taught us to suffer. Obtain for us, together with a prompt obedience, an invincible faith, which looks on beyond this earth and its sorrows. Teach us how to bury our earthly affections and desires in our Saviour's tomb, so that we may rise through Him to the hope of eternal joys, while waiting to receive their realization through His grace. Mother of Sorrows, comforter of the afflicted, teach us to find comfort in our troubles, by lessening those of our brethren. May we see through the darkness of this mortal life, the ever brightening dawn of the resurrection. Amen. Often to repeat, while comparing our sorrows to those of Mary, "Was there ever sorrow like unto her sorrow ?" To accept them in gratitude for those she has suffered for us. To expect with confidence the consolations which God ever gives to His obedient servants either on earth or in heaven.